Think back over the last five months and ask yourself what you've achieved. Ask Harry Aikines-Aryeetey and he probably wouldn't know where to begin. The 17-year-old from Sutton is making giant steps in the world of athletics. In July, he conquered the world and now he's BBC Young Sports Personality of the Year. Sprinting's his game and wherever he's gone, his feet have never let him down. Harry started running at school and while his friends played football in the park, he directed his energies towards homework and athletics. 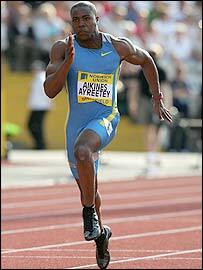 It wasn't long before trophies and medals were cluttering up his mantelpiece and after signing up for local club Sutton, the world stage got its first taste of Mr Aikines-Aryeetey. Bendigo in Australia was the location and it was the Commonwealth Youth Games in November 2004. It was only silver in the 100m, but Harry was still learning. Roll the calendar forward a few months to July this year and welcome to Marrakech. It was the World Youth Championships and history was about to made. Harry won gold in the 100m and 200m - it was the first time anybody had won the sprint double in the six-year history of the championships. 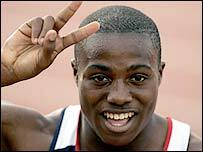 Clocking up 20.91 seconds for the 200m meant he was, at the time, the world's quickest over the distance. It was simply a sensational performance for any athlete, let alone being aged 17. And the plaudits came rolling in. He received a phone call from the IAAF in September inviting him to an occasion in Monaco. And within a few days all thoughts of the new school term were banished as he stood on the stage to collect the 2005 Rising Star Award just a few feet away from his idols. Olympic champions Justin Gatlin and Yelena Isinbayeva applauded his every move. So after rubbing shoulders with the stars and now with his hands on BBC's prestigious award, what's next in store? Harry is still firmly focused on passing his A-Levels - he's studying sociology, biology and PE. Having also just been named one of 80 athletes on England's world-class development programme and with London 2012 on the horizon, there's plenty to think about. "Athletics is going well but it won't go to my head," he told BBC Sport. "It will get to a point where it becomes so serious I will have to take it up as a career." It's going to be tough for Harry to juggle his running spikes with his homework, but if his development continues, he may just have to build an extension for his mantelpiece. And if anybody wanted to question his desire for success then they should hear his comments made in the summer at the IAAF ceremony. After meeting the mighty Justin Gatlin, he said: "I want him to be thinking 'Wow, I'm sitting next to Harry'."